Sabaton is a Grammis-nominated power metal band from Falun, Sweden formed in 1999. The bands main lyrical themes are those of historical wars. This is heard in albums Primo Victoria, Attero Dominatus and Coat of Arms where all of the songs, except final tracks, take inspiration from historical battles or war. Lyrical content drawn from World War I, World War II and the Vietnam war is prevalent and includes songs about battles and leaders on all sides of these conflicts. Sabaton was formed in 1999. 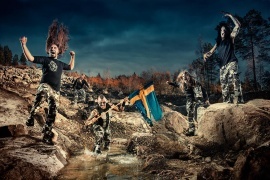 After the first songs were recorded in Peter Tägtgrens studio, The Abyss, Sabaton was contacted by a couple of record labels. The band decided to sign up for an Italian label who internationally released the promo CD Fist for Fight—including cover artwork by the legendary Ken Kelly (Manowar)—with the intention to promote forthcoming releases. A year after the first recordings were made Sabaton returned with a début album Metalizer, again working with Peter Tägtgren. The album was recorded 2002 but had a five year delay before release in 2007. Metalizer is counted as their first album despite being the third album released. Sabaton performed across Sweden, and after two years of waiting for the label to release Metalizer, Sabaton decided to record another album. But this time they would do it on their own, without the financial support of a record label. The band returned a second album titled Primo Victoria and found themselves in negotiations with several international record labels. One of the songs in the album, Into the Fire, made heavy reference to the Vietnam War. They eventually signed with Black Lodge, the metal division of Sound Pollution. In early 2005, they recruited Daniel Myhr to relieve Joakim Brodén, who played keyboards in addition to singing, of his keyboard duties. Their third album Attero Dominatus continued the war theme of Primo Victoria with songs like "Back in Control" (which focuses on the British retaking of the Falkland Islands during the Falklands War), "Attero Dominatus" (about the Battle of Berlin which brought about the end of World War II in Europe) and "Angels Calling" (about trench warfare during World War I), and was released in Europe on 28 July 2006. In March 2007, Sabaton released Metalizer as a double disc together with Fist for Fight, along with the previously unreleased song "Birds of War". As a follow up to Metalizer, in May 2008, Sabaton released its fourth album The Art of War an album inspired by the influential book by Sun Tzu. The decision to base the album upon Sun Tzus book came from the idea that in the 2000 years since the book was written, the human race has achieved many things but apart from weapon advancements, war and tactics have remained basically the same. The album contains the singles "Cliffs of Gallipoli" and "Ghost Division". The album has received extremely positive reviews so far. In September 2008 it was announced that Sabaton would be performing at the 2009 ProgPowerUSA X festival in Atlanta GA USA. In addition, Sabaton were the first band confirmed for the festival Bloodstock 09 in Derby, UK. Furthermore, they toured Europe in 2009 as an opening act on the Hammerfall Tour. After their Bloodstock performance, the band went on a tour with DragonForce, towards the end of 2009, for 18 shows in the UK. The band had hoped to begin recording the next album in October but with concerts booked and the DragonForce support tour the following month, it was pushed back. On Wednesday December 23, 2009, the band announced the name of their forthcoming album. Coat of Arms contains a majority of songs about World War II, but also has songs about other wars, like the Winter War "White Death". They announced it on their official website, and posted a link to a YouTube video containing the album art and a teaser music sample. Coat of Arms was released on May 21, 2010. The first music video, for Uprising, was released on August 1, 2010 and features Peter Stormare. This was accompanied by a European tour. A second music video, for Screaming Eagles, was released on May 25. On March 31, 2012 vocalist Joakim Broden confirmed rumors that the band would be going separate ways. Guitarists Oskar Montelius and Rikard Sundén, drummer Daniel Mulback and keyboardist Daniel Mÿhr would be departing Sabaton for unspecified reasons. Sabaton would be joined by touring members Chris Rörland and Thobbe Englund on guitar, and Robban Bäck on drums. Until a new keyboardist is found Sabaton will use digital recordings of their keyboard while touring. Following the announcement of a new lineup taking the stage the first single for the album "Carolus Rex" titled "Carolus Rex" was released on April 4, 2012. The single was immediately released in both Swedish and English lyrical formats for download off of Swedish iTunes, and was available for world wide download on April 8, 2012. Coinciding the release of the new single, Sabaton also announced their world wide tour in support of "Carolus Rex" headlined as "The Swedish Empire Tour". This will also be the first time Sabaton has performed live with the new lineup. "Carolus Rex" was released on May 22, 2012 in the United States and Sweden, and May 25, 2012 in the rest of Europe. The album is available in both Swedish and English versions. Sabaton will also release a deluxe edition of "Carolus Rex" containing 2 discs of both lyrical versions of the album. The former members of Sabaton have formed a band called "Civil War", including vocalist Patrik Johansson and bassist Stefan Eriksson. Register now your email address and never miss events, dates and news for SABATON.